Factory-built chimneys are engineered and tested systems for use with wood, gas, oil and coal burning appliances. 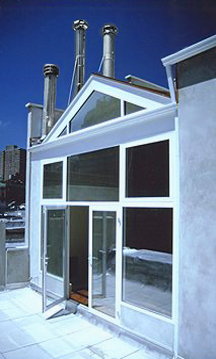 All factory-built chimneys and chimney units shall be listed and accepted in accordance with the applicable reference standard and shall be installed in accordance with the temperature conditions and height limitations of the listing and acceptance, the manufacturer's instructions and the New NYC Construction Codes, whichever is the most restrictive. Flue gas temperatures in the chimney shall not exceed the limits employed during listing tests and as required by the NYC Building Code. Factory built chimney's low weight reduces footing requirements and ensures fast installation time. They are designed for use with fireplaces, woodstoves, furnaces, boilers, stoves, water heaters, or other appliances fueled by wood, oil, coal or gas. NYC Local Law requires all prefabricated chimneys, fireplaces and liners to be approved by the MEA Division of City of New York Department of Buildings. MEA review includes checking specific model numbers, evaluating the test reports, and determining any terms or conditions for product use in New York City. Remember: It is the building owner's responsibility to ensure that all materials and equipment used in the construction of his or her building have MEA numbers as required by Code. If a building owner uses a piece of equipment or material , like a factory built chimney, liner or fireplace, that requires an MEA number but does not have one, he or she is subject to a violation. Furthermore, the chimney or appliance approved by MEA Division shall be installed according to the New NYC Building Code, which means that MEA approval doesn't give you a "green light" to install "any" prefabricated chimney or fireplace. This is a very common mistake done by many chimney contractors, fireplace sellers and chimney installers, which could be dangerous and very expensive to correct. For example, the New York City Building Code rules like "Chimney Height Limitations and Tests" for wood burning appliances shall always be carefully reviewed and followed. We recommend only UL Listed, high quality-stainless steel 103 Type HT chimneys for masonry built wood burning fireplaces and gas or oil burning boilers and heaters. These chimneys are listed to the UL 103HT Standard for Solid and Liquid Chimney Systems installed in the USA. The UL 103HT Standard requires the chimney to withstand three 10 minute chimney fires at 2100°F and is required for use with wood burning appliances like masonry fireplaces or inserts. Remember: According to the New York City Building Codes, the factory-made (wood burning) chimneys, liners and fireplaces shouldn't be installed and used in residential or commercial buildings, unless they are tested to recognized National Standards, listed for solid fuels by approved testing agencies and comply with the Building Code of the City of New York. Important: We urge homeowners to be very careful when installing wood burning factory - made fireplace and chimney units in Manhattan, even if the systems were approved by MEA Division. To avoid serious and costly problems call Chimney Pro's Code Expert for professional advice and help with your chimney and fireplace installation.